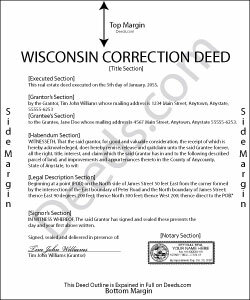 Use the correction instrument to correct an error in a deed in Wisconsin. *	An error in the legal description, "including a distance; angle; direction; bearing; chord; lot, block, unit, or building number or letter; appurtenant easement; section number; township name or number; municipality, county, or state name; range number or meridian; certified survey map number; or subdivision or condominium name." *	The addition, correction, or clarification of other information on the deed: party's name, including spelling; a first or middle name or initial; a name suffix; alternate names by which the party is known; and description of an entity as corporation, company, or similar identifier. If any corrections are made to the legal description, the complete corrected legal description must be attached as exhibit page, in addition to the incorrect version on the attached prior deed. The correction instrument may be executed "by a person having personal knowledge of the circumstances of the conveyance and of the facts recited in the correction instrument" (706.085, Wis. Stats.). This includes the grantor, the grantee, the person who drafted the prior deed, and the person who acted as the settlement agent in the prior conveyance. In the case of the latter two especially, "the basis for the person's personal knowledge" must be stated. Furthermore, the law specifies corrections that must be signed by the grantor or the grantee. The grantor only can sign if land is added through the correction. If, on the other hand, a parcel is being removed, the grantee must sign. If a lot or unit number is being corrected and the lot or unit incorrectly recited on the conveyance is also owned by the grantor," the grantee's signature is required as well. If the incorrectly recited parcel is not also owned by the grantor, any party identified above can sign. The same holds true if the correction instrument "supplies a lot, block, unit, or building number or letter that was omitted from the conveyance" (706.085, Wis. Stats.). The correction instrument must be acknowledged or authenticated by a notary or official authorized to do so. Patricia And James J. said: No review provided.